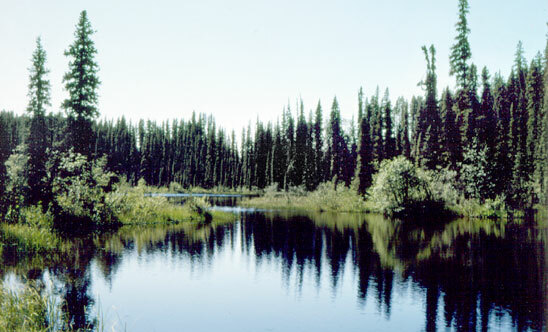 Cold Forests are part of the great boreal spruce forests that extend across northern North America. Takla Landing. Robert Cannings, RBCM. Ecologists recognize 12 different major forest types and a myriad of variations in British Columbia. These can be grouped into Cold Forests, Wet Forests and Dry Forests. Cold Forests are the subalpine and boreal forests dominated by Spruce, Lodgepole Pine and Subalpine Fir that blanket most of the province's interior. Wet Forests include the impressive rain forests of the coast dominated by Western Hemlock and Western Redcedar, and their counterparts in moister parts of the interior. The Dry Forests consist of the Ponderosa Pine and Douglas-fir forests of the southern interior valleys and the coastal Douglas-fir forests on southeastern Vancouver Island and the Gulf Islands. This is a photograph of a subalpine forest reflected in the waters edge of a lake, near Rossland, British Columbia. This is an image of Cow Parsnip in the foreground and subalpine forests in the background near Manning Provincial Park, British Columbia. This is a side view photograph of a bull moose. This is a photograph of a forest of Douglas-fir and Ponderosa Pine near Princeton, British Columbia. This is a photograph of the side view of a Calliope Hummingbird in mid-flight. This is a photograph of an arbutus tree jutting out over the ocean, with islands in the background. This is a photograph of a temperate rain forest in the Carmanah Valley. This is a photograph of Devil’s Club with red berries.